One of the ways we determine galactic distances is through a kind of supernova known as Type Ia. These supernovae are useful because they always have a similar luminosity (brightness). This means we can observe how bright a Type Ia Supernova appears, and then calculate how far away it is since we know how bright it actually is. One of the ways we can tell this kind of supernova from other kinds is from the spectrum of its light. When we look at the spectrum of a Type Ia Supernova, we don’t see lines indicating the presence of hydrogen or helium, which is a bit unusual given that those are the two most abundant elements in the universe. Another thing we notice is large quantities of nickel-56. This is a radioactive element with a half-life of days, which means it must have been formed within the supernova explosion itself. Both of those bits of evidence point to the fact that these supernovae are the result of a white dwarf explosion. White dwarfs are the remnants of a Sun-like star. After the star has exhausted its ability to fuse hydrogen and other elements and its outer layers of mostly hydrogen have evaporated, the remains (mostly carbon and oxygen) collapse into a dense mass. A white dwarf is so dense that is is the pressure of the electrons that keeps it from collapsing further. But electron pressure can only hold up against the weight of gravity to a point. This point is known as the Chandrasekhar limit, and it is about 1.4 solar masses. The traditional view for Type Ia Supernovae is that they are the result of dance of two close binary stars. Two Sun-like stars orbit each other at a somewhat close distance. One of the two stars is slightly larger than the other, so it burns a little hot, and dies a little sooner than the other star, becoming a white dwarf. Some time later the second star begins to die, and swells to a red giant. For a Sun-like star the red giant can be as large as the Earth’s orbit. In a binary system this means the outer layers of the red giant can can be captured by the companion star. It can even engulf the two stars in what is called a common envelope. The result is that some of the mass of the second star is transferred to the white dwarf during this stage. As the white dwarf continues to capture mass from the other star, its mass continues to rise, approaching that ultimate limit. As the this limit is reached, the star begins to collapse into a neutron star. This causes a cascade of rapid fusion within its core, which rips the white dwarf apart. The white dwarf explodes as a Type Ia Supernova. Since this collapse always occurs around the Chandrasekhar limit, this explains why Type Ia Supernovae always have the same luminosity. There are problems with this scenario, however. One is that the amount of nickel-56 in these supernovae can vary by a factor of 10. If they were all due to an explosion of a white dwarf, one would expect the fractions of elements such as nickel would would be more consistent. An alternative model is that the explosions are due not to a white dwarf being pushed past its limit, but rather due to a collision of two white dwarfs. This model is similar, in that it starts with a dance of two stars, but this time they both end their lives as white dwarfs. If they are simply a binary star system, that might be the end of the story, but it is not uncommon for a close binary to have a third star orbiting the pair. As this third star gravitationally interacts with the binary dwarfs, it can cause their orbits to degrade to the point where they collide with each other. 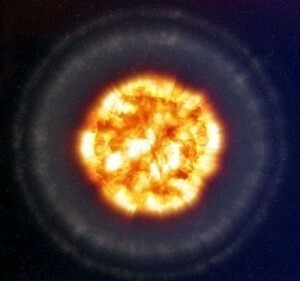 The resulting explosion creates a Type Ia Supernova. You would think this type of collision would be relatively rare, but a recent paper in Astrophysical Journal Letters shows that they could be common enough to account for all Type Ia Supernovae. The authors simulated trinary star systems to determine the fraction of systems that lead to white dwarf collisions. Given the number of white dwarfs that are in such a system, they then calculated the rate at which such collisions can occur. The result is in the same range as the number of supernovae we actually observe. The collision model also addresses some of the problems with the mass-transfer model, such as the wide variation of nickel-56. So it looks like Type Ia Supernovae aren’t typically due to the death of a single white dwarf, but due to the collision of two. Paper: Kushnir D, Katz B, Dong S, Livne E, Fernández R. HEAD-ON COLLISIONS OF WHITE DWARFS IN TRIPLE SYSTEMS COULD EXPLAIN TYPE Ia SUPERNOVAE. ApJ. 2013;778(2):L37-.